ORNL scientists have created a new composite material for additive manufacturing that makes use of lignin, a biofuels byproduct. CREDIT Oak Ridge National Laboratory. 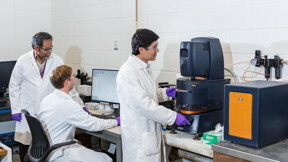 Scientists at the Department of Energy's Oak Ridge National Laboratory have created a recipe for a renewable 3D printing feedstock that could spur a profitable new use for an intractable biorefinery byproduct: lignin. The discovery, detailed in Science Advances, expands ORNL's achievements in lowering the cost of bioproducts by creating novel uses for lignin--the material left over from the processing of biomass. Lignin gives plants rigidity and also makes biomass resistant to being broken down into useful products. The lignin-nylon composite is patent-pending and work is ongoing to refine the material and find other ways to process it. The ORNL research team also included Sietske Barnes, Christopher Bowland, Kelly Meek, Kenneth Littrell and Jong Keum. The research was funded by DOE's Office of Energy Efficiency and Renewable Energy's Bioenergy Technologies Office. ORNL is managed by UT-Battelle for the Department of Energy's Office of Science, the single largest supporter of basic research in the physical sciences in the United States. DOE's Office of Science is working to address some of the most pressing challenges of our time. For more information, please visit https://science.energy.gov.